Home: >Browse Listings >Authors >Claiborne, J. F. H.
J. F. H. Claiborne, the uncontested father of Mississippi history, was a planter, politician, and popular journalist who wrote in the style of the Southwestern Humorists, but his most notable achievement may stem from his interest in his native states history, a passion that led him to amass an important collection of historical papers, documents, and memorabilia upon which he largely based the first significant historical account of Mississippi. He was born John Francis Hamtranck Claiborne near Natchez, Mississippi, on April 24, 1807, when Mississippi was still a territory. He received a classical education in Mississippi and Virginia. He studied law and was admitted to the bar, but he did not stay long in the legal profession. In 1828, he married Martha Dunbar of Dunbarton Plantation east of Natchez, their intermittent home for a number of years. That same year, he became active in politics, first as an editor of the Natchez Statesman and Gazette, then as a Mississippi legislator and then, from 1835 to 1837, as a member of Congress. In 1835 he established a plantation near plantation using borrowed money, but he lost everything in the Panic of 1837. The following year, he lost his congressional seat in a disputed election. For the next few years, he struggled to overcome his political defeat and financial ruin, as well as consumption, which would plague his health throughout his life. 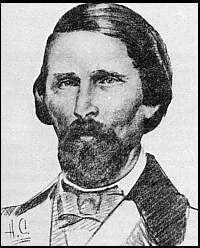 In 1841 he became editor of the Natchez Mississippi Free Trader, and from 1842 to 1844, he was appointed by President John Tyler to serve as Chairman of the Board of Choctaw Commissioners, in which he was to investigate claims under the Treaty of Dancing Rabbit Creek (1830) and to make recommendations about the legitimacy of claims. He returned to journalism in 1844, editing the Jeffersonian 1844-46, the Statesman 1849-51, and the Louisiana Courier 1850-53, all of them near New Orleans. Also during this time he made money speculating in cotton, earning enough to purchase in 1849 a seashore plantation in Shieldsboro, Hancock COunty, where he lived until it burned in 1870. An ardent Jacksonian Democrat, Claiborne was popular as a newspaper editor, partly because he wrote clearly and forcefully and partly because of the political views he espoused. During this era of sectional conflict, he contended that security for Southern institutions and values required two major achievements: economic independence, to be gained by agricultural diversification, territorial expansion, and foreign trade; and cultural independence, which would begin with a public school system that taught Southern authors. A white supremacist, he defended slavery as morally right, and he upheld the right of states to secede from the union, though he consistently opposed secession. His most important journalistic contributions were two series of essays on the piney woods of Mississippi and Louisiana, written after he had traveled through the pine belts of each state. The first appeared in the Mississippi Free Trader and the second in the Louisiana Courier. The essays represent a detailed description of the people he met, their homes, dress, habits, and economic activity, in a prose style reminiscent of the Southwestern Humorists, both humorous and informative; the essays would serve as an important resource for future historians on the rural plain folk, the largest social class in the state. Two of the best are Rough Riding Down South, which was later published in An Anthology of Mississippi Writers, and A Trip through the Piney Woods, which the Purdy Press reprinted in 1927. Indeed, it is as historian that Claiborne is most remembered. Though he wrote two second-rate biographies that were published in 1860, his interest in history would be the driving force that led to his accumulation of numerous historical documents and artifacts which would become the principal source for his major work: Mississippi as a Province, Territory, and State, with Biographical Notices of Eminent Citizens (1880). As early as the late 1850s he wrote letters requesting historical data on Mississippi, but he received a poor response to his inquiries. It was not until after the Civil War and numerous advertisements in Mississippi and out-of-state newspapers that he began to accumulate a number of papers and documents. His collection is now located in three repositories: the Department of Archives and History in Jackson, Mississippi; the Library of Congress; and the Library of the University of North Carolina. The collection remains today an indispensable source for historians of the Old Southwest. The history he published was volume one of a proposed two-volume set. The study falls into three main parts. The first is a twenty-eight-chapter history of Mississippi from the earliest Spanish explorations in the 1540s to the end of the Creek War. The second part consists of thirteen chapters of biographical sketches of eminent citizens, and the last is two chapters, one on jurisprudence, the other on Indians. Overall, the work suffers from the authors political and personal prejudices, as well as several failures to edit or correct his source materials, some of which were simply included in their original form. Despite its shortcomings, however, the volume is a splendid accomplishment, well organized, clearly written, exciting in places, and rich in information. As late as 1964, when the Mississippi Historical Society published a reprint edition of the volume, historian John K. Bettersworth, while acknowledging its faults, praised Claiborne as the author of the best history of the state ever written. Volume two was never published. The manuscript, which probably carried the history through Reconstruction, was completed in 1884 but was lost in a fire that destroyed his home in March 1884. His shock and grief over his loss no doubt contributed to his death two months later on May 17, 1884. Life and Correspondence of John A. Quitman, Major-General U.S.A., and Governor of the State of Mississippi. 2 vols. New York: Harper and Brothers, 1860. Life and Times of Gen. Sam. Dale, the Mississippi Partisan. New York: Harper and Brothers, 1860. Mississippi, as a Province, Territory and State: With Biographical Notices by Eminent Citizens. Jackson, Mississippi: Power and Barksdale, 1880. Speech, on the Bill “For the Relief of Jefferson College,” Delivered in the House of Representatives, of the State of Mississippi, December, 1830, by ... a Representative from the County of Adams. Washington, Mississippi: Cadet Office, 1830. Argument Submitted by Messrs. Claiborne and Gholson, Representatives from the State of Mississippi, to the Committee of Elections. City of Washington: Blair & Rives, 1837. Proceedings of the Board of Choctaw Commissioners. Col. Claiborne’s Statement. 1843. Historical Account of Hancock County and the Sea Board of Mississippi. An Address delivered ... at the Request of the Citizens, and in Compliance with a Resolution of Congress ... July 4th, 1876. New Orleans: Hopkins Printing Office, 1876. A Sketch of Harvey’s Scouts, Formerly of Jackson’s Cavalry Division, Army of Tennessee ... Being a Part of the Second Volume of Claiborne’s History of Mississippi. Published for private distribution. Starkville, Mississippi: Southern Livestock Journal Print, 1885. A Trip Through the Piney Woods. New York: Purdy Press, 1927. Lagrone, C. M. An Index to J.F.H. Claiborne’s Mississippi as a Province, Territory and State. Thesis. University of Mississippi, 1928. Lang, Herbert Howard. Nineteenth Century Historians of the Gulf States. Thesis. University of Texas, 1954. Riley, Franklin Lafayette. Life of Col. J.F.H. Claiborne: Reprinted from Publications of Mississippi Historical Society, Vol. 7. Oxford, Mississippi: The Society[? ], 1903. Williams, Frederick DeForrest. The Career of J.F.H. Claiborne, States’ Rights Unionist. Thesis. Indiana University, 1953. Williams, Frederick D. “Claiborne, J. F. H.” Lives of Mississippi Writers, 1817-1967. Ed. James B. Lloyd. Jackson: University Press of Mississippi, 1979. 88-91. This page has been accessed 4219 times. About this page counter.